What you see here is my latest knitting project, which I started over Thanksgiving weekend even though I hadn’t quite finished the project I had been working on most recently. It’s a pair of socks, and everything was going along quite nicely until I got to the heels. Can you see the problem? (With the socks, not the photo; don’t let the iffy focus and lamp glare distract you.) Yes, that’s right, the stripes don’t match. The heels are also a little too pointy, but that part would be okay once I was wearing them. 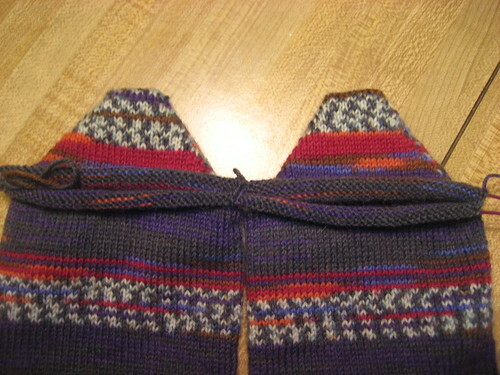 The stripes were fine before the heel, a few stitches different from sock to sock but that’s acceptable. Somehow just as I was starting the first heel, I dropped a stitch and didn’t notice until I’d finished turning the heel entirely. When I did notice, I decided, based on where the drop was and what the next step in the sock was, that I could just pick it up with my trusty crochet hook and move on to the next heel. So I did. As I worked the second heel, I could see it was not striping quite the same but I plowed on ahead, thinking I could just be mellow and accept the differences in the stripes. When I finished that heel, I found I’d dropped two stitches. I picked them up and knit a few rounds on both socks up the leg, after leaving a length of yarn unworked on one to match the stripes back up again, but those heels kept bothering me. Not only were they not striped the same, they weren’t shaped the same, either, since the dropped stitches mean they weren’t worked on the same number of stitches as each other. I could have given myself a lecture about acceptance and letting go of perfectionism, but I decided instead to rip back to before the heels. The next time I’ll be more careful. But before that, I think I need to get a new needle, as the tips on one of these I’ve been working with are pulling away from the cable, which means they’re catching on the stitches every time I start a new round. Not good. I know KnitPicks customer service is good about sending replacements, but I want to knit now. I don’t think I have another one this size, so a trip to the yarn store might be in order. Maybe I’ll get one long circular and switch these socks over to the Magic Loop method. Though finding one long circular in a size zero might not be the easiest thing. Maybe I should just call KnitPicks and get a new needle sent out and start something else for which I do have the right needle. Or I suppose I could finish up the project I abandoned in favor of starting these socks. So many choices, so little knitting time. It would surprise me if someone didn’t carry a really long size 0. Lots of people do magic loop.